Scientists and engineers at JPL have Mount Sharp in their sites. It’s no ordinary mountain — it’s situated on Mars. The 5,000 meter high mountain is home to exposed layers of some promising sedimentary rocks, which hold clues to Mars’ geologic, and perhaps biological, history. Unfortunately, Mount Sharp is 10K away from the current home of the Curiosity rover. So, at a top speed of around 100 meters per day it will take Curiosity until the fall of 2013 to reach its destination. NASA’S Curiosity rover is about to have its cake and eat it too. Around September, the rover should get its first taste of layered sediments at Aeolis Mons, a mountain over 5 kilometres tall that may hold preserved signs of life on Mars. Previous rovers uncovered ample evidence of ancient water, a key ingredient for life as we know it. 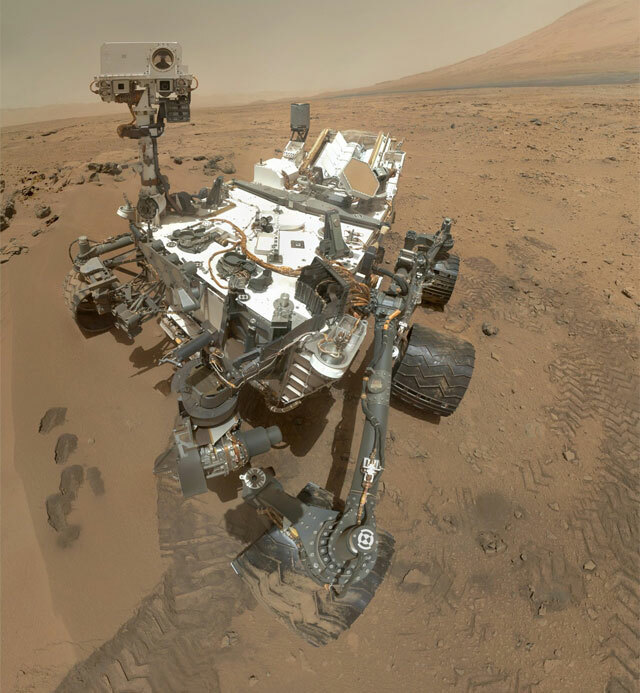 With its sophisticated on-board chemistry lab, Curiosity is hunting for more robust signs of habitability, including organic compounds – the carbon-based building blocks of life as we know it. Observations from orbit show that the layers in Aeolis Mons – also called Mount Sharp – contain minerals thought to have formed in the presence of water. That fits with theories that the rover’s landing site, Gale crater, was once a large lake. Even better, the layers were probably laid down quickly enough that the rocks could have held on to traces of microorganisms, if they existed there. If the search for organics turns up empty, Aeolis Mons may hold other clues to habitability, says project scientist John Grotzinger of the California Institute of Technology in Pasadena. The layers will reveal which minerals and chemical processes were present in Mars’s past. “We’re going to find all kinds of good stuff down there, I’m sure,” he says. NASA pulled off another tremendous and daring feat of engineering when it successfully landed the Mars Science Laboratory (MSL) to the surface of Mars on August 5, 2012, 10:32 PM Pacific Time. The MSL is housed aboard the Curiosity rover, a 2,000-pound, car-size robot. Not only did NASA land Curiosity a mere 1 second behind schedule following a journey of over 576 million kilometers (358 million miles) lasting around 8 months, it went one better. 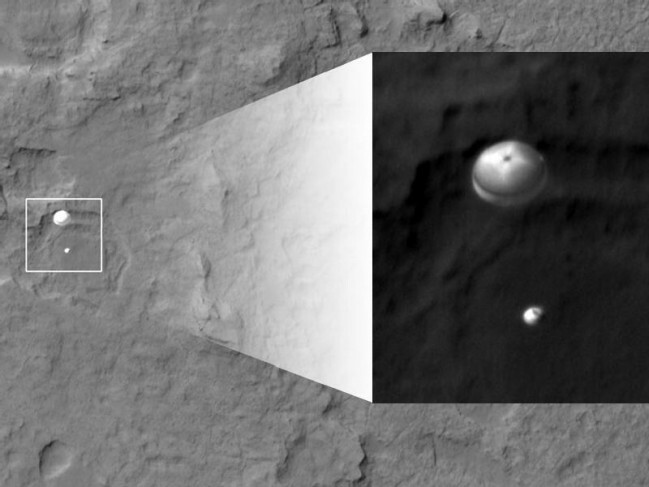 NASA had one of its Mars orbiters — Mars Reconnaissance Orbiter — snap an image of MSL from around 300 miles away as it descended through the Martian atmosphere, with its supersonic parachute unfurled. Another historic day for science, engineering and exploration. This is the time when NASA’s latest foray into space reaches its zenith — the upcoming landing of the Curiosity rover on Mars. 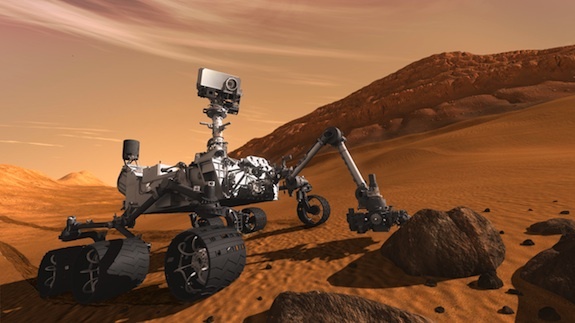 At this time NASA’s Mars Science Laboratory (MSL) mission plans to deliver the nearly 2,000-pound, car-size robot rover to the surface of Mars. 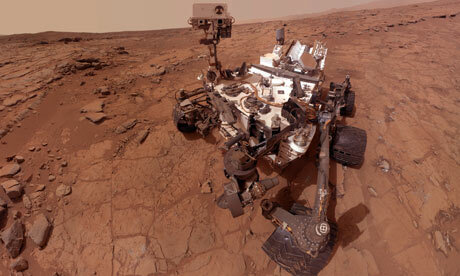 Curiosity will then embark on two years of exploration on the Red Planet. For mission scientists and science buffs alike Curiosity’s descent and landing will be a major event. And, for the first time NASA will have a visual feed beamed back direct from the spacecraft (but only available after the event). The highly complex and fully automated landing has been dubbed “the Seven Minutes of Terror” by NASA engineers. Named for the time lag of signals from Curiosity to reach Earth due to the immense distance, mission scientists (and the rest of us) will not know whether Curiosity successfully descended and landed until a full 7 minutes after the fact. For more on Curiosity and this special event visit NASA’s Jet Propulsion MSL site, here. Perhaps the recent dimming of Wikipedia, for 24 hours on January 18, (and other notable websites) in protest of the planned online privacy legislation in the U.S. Congress, wasn’t all that bad. Many would argue that Wikipedia has been a great boon in democratizing content authorship and disseminating information. So, when it temporarily shuttered its online doors, many shuddered from withdrawal. Yet, this “always on”, instantly available, crowdsourced resource is undermining an important human trait: intellectual curiosity. When Wikipedia went off-air many of us, including Jonathan Jones, were forced to search a little deeper and a little longer for facts and information. In doing so, it reawakened our need to discover, connect, and conceptualize for ourselves, rather than take as rote the musings of the anonymous masses, just one click away. Yes, we exercised our brains a little harder that day. Only after a couple of glasses of champagne did I look again and realise that Wikipedia is offline only for 24 hours, in protest against what it sees as assaults on digital freedom. OK, so I’m slightly hamming that up. Wikipedia is always the first site my search engine offers, for any artist, but I try to ignore it. I detest the way this site claims to offer the world’s knowledge when all it often contains is a half-baked distillation of third-hand information. To call this an encyclopedia is like saying an Airfix model is a real Spitfire. Actually, not even a kit model – more like one made out of matchsticks. I have a modest proposal for Wikipedia: can it please stay offline for ever? It has already achieved something remarkable, replacing genuine intellectual curiosity and discovery with a world of lazy, instant factoids. Can it take a rest and let civilisation recover? On its protest page today, the website asks us to “imagine a world without free knowledge”. These words betray a colossal arrogance. Do the creators of Wikipedia really believe they are the world’s only source of “free knowledge”? Institutions that offer free knowledge have existed for thousands of years. They are called libraries. Public libraries flourished in ancient Greece and Rome, and were revived in the Renaissance. In the 19th century, libraries were built in cities and towns everywhere. What is the difference between a book and Wikipedia? It has a named author or authors, and they are made to work hard, by editors and teams of editors, to get their words into print. Those words, when they appear, vary vastly in value and importance, but the knowledge that can be gleaned – not just from one book but by comparing different books with one another, checking them against each other, reaching your own conclusions – is subtle, rich, beautiful. This knowledge cannot be packaged or fixed; if you keep an open mind, it is always changing.